Editor’s note: Diana Villiers Negroponte is a public policy scholar at the Woodrow Wilson International Center for Scholars. The views expressed are her own. As speculation has continued over what role Russian support might have played in the alleged shooting down of a Malaysian Airlines flight by pro-Russian rebels, one question has inevitably arisen: Is Russia becoming isolated? But while international attention is focused on Washington and European capitals as they mull whether to impose tougher sanctions, it is worth remembering that Russian interests and influence extend far beyond Europe’s borders. Indeed, despite U.S. President Barack Obama’s suggestion earlier this year that Russia is merely a “regional power,” a recent visit to Latin America underscored that Russian President Vladimir Putin’s interests don’t end in Europe’s backyard. On July 11, Putin began a weeklong trip to Brazil, Argentina, Nicaragua and Cuba, which included attending the sixth BRICS’ summit and the launch of the organization’s New Development Bank. But what did the trip, which included meetings with Nicaraguan President Daniel Ortega, President Cristina Fernandez of Argentina and a photo-op with Venezuelan President Nicolas Maduro, say about Russia’s foreign policy? One key element of such an approach is trade, which was front and center of Putin’s trip. After all, Brazil’s trade with Russia had declined over the last two years, and practical steps were therefore needed to reverse the downward trend. With this in mind, Rosneft, Power Machines OJSC, bus manufacturers KamAZ and Marco Polo reportedly signed commercial agreements to spur development in industrial cooperation with Brazilian companies. In Cuba and Argentina, meanwhile, Inter RAO and Rus Hydro, both power generation companies, reportedly signed contracts worth $1.6 billion in Cuba and $2 billion in Argentina for the sale of energy generation units. In addition, Rosatom is competing in Argentina for the construction of a third generating unit at the Atucha nuclear power station. And, although Putin did not actually visit Caracas, he did meet with Maduro in Brasilia, and some of the most notable activity centered around Venezuela. For example, Rosneft agreed to purchase drilling and oilfield service assets owned by Weatherford International in Venezuela as part of Rosneft’s development of its energy service business. Also, Russia is reported to have extended a new line of credit to Venezuela, although details have yet to be made public. But signs of Russian ambitions with Latin America extended beyond trade deals. While in the region, Putin sought to confirm the deployment of the GLONASS global positioning system in the Americas – the Russian government’s alternative to the U.S. government-sponsored GPS system. Russia recently denied access to GPS data in territories it controls, while the U.S. has denied the placement of GLONASS over its territory. Putin is eager to challenge GPS and the U.S. government by finding additional sites in the Western Hemisphere beyond Brazil and the Chilean coast over which to install new satellite stations. During his visit, both Cuba and Argentina agreed to the installation of GLONASS high altitude satellite navigation systems. Another headline grabbing example of Russia’s intention to project power and influence beyond Eurasia came with a report by Kommersant that an agreement had been reached with the Cuban government to re-open the former Soviet listening station at Lourdes, which had been closed since 2001 – a move widely seen as a direct response to the U.S. Treasury Department’s decision to impose sanctions on certain Russian banks and energy companies. And Russia also appears determined to cement ties with the region’s military customers, with Russian manufacturers continuing to offer helicopters and military cargo planes for sale, an approach that continues a tradition of Russian arms sales in the hemisphere. All this suggests Moscow is making a concerted effort to win friends, friends whose votes and support he will likely have to rely on in international venues like the U.N. General Assembly, when Russia is expected to come under renewed pressure over the annexation of Crimea as well as its alleged role in providing arms and other assistance to rebels in Ukraine who are widely blamed for downing flight MH17 last week. And with the U.S. Treasury Department tightening sanctions still further, Putin will also no doubt be keen to bolster the number of options for Russia’s economic interests. 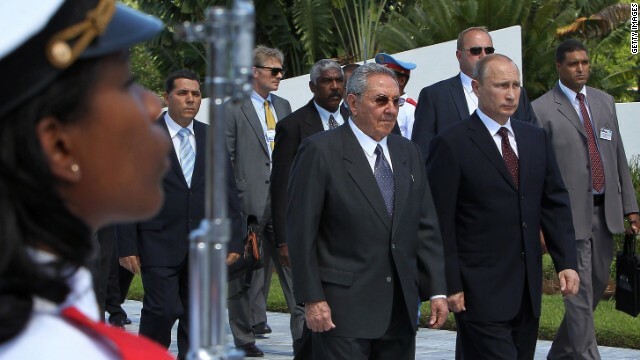 True, Putin chose to reinforce friendships with Cuba and Nicaragua that had mattered during the Cold War but whose economies today present few market opportunities for Russian business – his behavior is consistent with Russian nostalgia for the Soviet era. Yet the emphasis not just on traditional trade but also geostrategic interests underscores Russia’s aspiration for global reach. Ultimately, Putin’s recent visit presents no immediate cause for alarm to U.S. national security and interests. But it should be a reminder to U.S. policymakers, if one were needed, that the Russian bear will not allow itself to be caged in. Excellent discussion – I was enlightened by the info , Does anyone know where my business could possibly access a blank DC RAD 23 copy to use ?